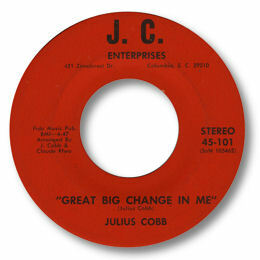 South Carolina artist Julius Cobb only had a few 45s to his name, but his band was popular in Greenville and Columbus in the 60s. His earthy baritone always brought out the best in his own songs, which he released in a series of his own labels. 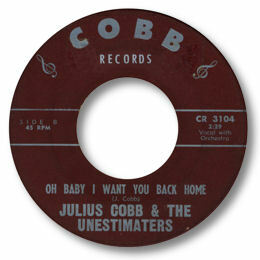 Oh Baby I Want You Back Home is a fine R&B tinged ballad with muted horns and lovely rhythm touches from his band, the interestingly named “Unestimaters” this disc found its way to King subsidiary Bethlehem but national distribution still didn’t push it into the top sellers list. Great Big Change In Me is his key deep soul ballad – a highly listenable 12/8 number with a great horn line and fine piano and organ. Love the stop/go feature as well. Cobbs’ uptempo version of Buck Owens’ “Excuse Me” is worthy Southern Soul as well. UPDATE ~ Naoya Yamauchi writes with details of another Julius Cobb 45 on Soft. This is now included in the discography below. Thanks to Naoya Yamauchi for the extra info and to my great friend Greg Burgess for the Titanic 80 45 info..